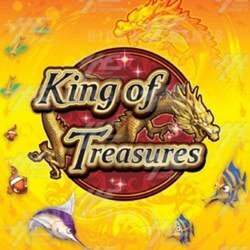 King of Treasures is the second addition to the Ocean King series of arcade games. It is a video redemption arcade game with an oceanic theme where the players will get tickets for catching fish. The game uses the same controls, fish and mini game features as Return of the King, but has also added extras for players to enjoy. In King of Treasures a machine gun has been added to the player's arsenal and can be accessed by clicking the joystick upwards twice. All the original characters are in this game as well, with the addition of 3 extra characters – Laser Crab, Roulette Crab and Golden Dragon! Golden Dragon is worth 300-500 points for players and the Laser and Roulette Crabs, like the Explosive Crab, are fun features for players to enjoy. Lightening Chain: there are nine types of fish which are subject to chain thunder: Snapper, Clown Fish, Butterfly Fish, Fugu, Lionfish, Flounder, Lobster, Spearfish and Octopus. When players use Lightening Chain they can get up to nine kinds of fish at once and win extra points. Vortex Fish: each fish (except Devilfish, Shark, Killer Whales, Humpback Whales and the Crabs) have a Vortex feature. When a player picks up the Vortex feature, the fish captures all the same fish near it for the player. Explosive Crab: catching this crab triggers a large explosion and get more points for all the fish the explosion affects. Laser Crab: when players capture the Laser Crab they get one laser beam shot, which they have a limited time to aim and shoot to capture a lot of fish at once. Roulette Crab: when players capture this crab, it will begin the Golden Roulette bonus game. A roulette wheel will appear on the screen in front of the player and will start spinning. Players must press the ‘SHOOT' button to stop the spinning and win points. The inner roulette ring scores the highest points. Please note that with this software upgrade difficulty level has now been increased to ten! This video shows the Playportal cashless card system pre-installed at the factory on an 8 player King of Treasures machine. The PlayPortal card system offers an alternative to coin, token, bill and key in/out payment for arcade machines. The 8 player King of Treasures machine is a fish hunting video redemption machine that yields a higher income than standard 6 player cabinets. Now available pre-installed on King of Treasure and Ocean King machines ordered from Highway Entertainment and our partner Arcade Spare Parts. Gameplay of King of Treasures, a fish hunting video redemption (videmption) game available from Highway Entertainment. The video demonstrates typical gameplay from the machine with players winning various features and betting different amounts of credit each shot.